This is the question that framed the first few weeks of the Integrated Communications Campaigns class I am in right now. We laughed as we discovered the power of the silly idea and we pondered the theory of idea generation. In an advertising campaign that “big idea” is the seed that is planted that starts the campaign. It’s the insights about people and society that lead you to a creative way to get your message to the masses. It is what drives the engagement, the communication, and the response. Recently, we were given a task that asked us to look at an existing advertising campaign and tell the story of the idea. There really weren’t any other parameters to the assignment, and we were free to choose any campaign we wished (which isn’t as easy as it sounds!). Planning for and executing this presentation really hit home for me — it showed me that an idea in a media world doesn’t mean anything unless it is driven by research and insight. And that telling the whole story of an idea is the perfect way to sell it, to not only who you are presenting to, but to the masses when the campaign takes off. And while, yes, the Kony 2012 campaign has its criticizers, and while we can’t be 100% certain that its makers’ intentions are pure, the idea has planted its seed and the story is being told around the world. And the execution is just about flawless. 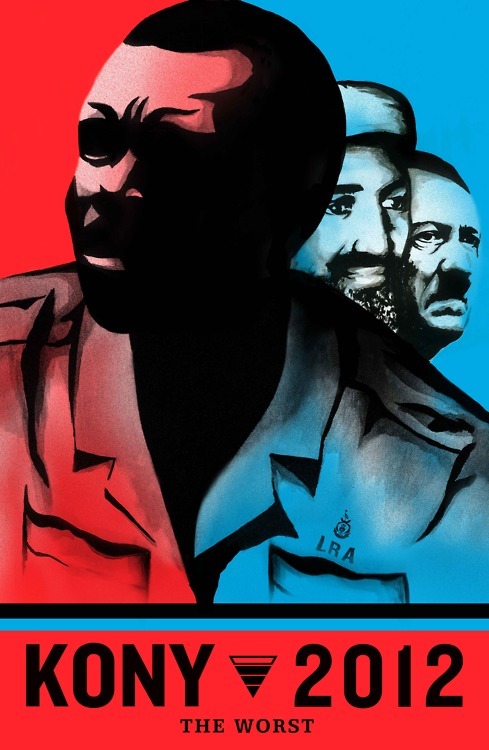 Facebook newsfeeds are cluttered, #stopkony is the number 1 trending topic on Twitter around the world, and the hits on YouTube just keep getting higher. I find this to be a great example of how the story of an idea is being told to effectively market something, whether you feel it be to market the personal bank account of the Invisible Children or to market the cause they are trying to raise awareness for. After months and months of preparation, it has come and gone. But those twelve hours of my life have forever changed my outlook on what it means to serve a greater community. Texas THON is an event that is so near and dear to me, I find it hard to put into words how I felt after the big reveal on Saturday night. I was overwhelmed with happiness and pride in myself and my team, as we have worked tirelessly since last May planning an event that starts and ends in what feels like a mere matter of seconds after the fact. Yes, you read that right. We raised $50,839.01 for the Dell Children’s Medical Center of Central Texas. This more than doubles the amount of money we raised last year. I think you can see from the looks on our faces that it was a very emotional moment and a beyond special day. Between the kids I met and the participants I interacted with throughout the day, I will be forever touched by what happened in Gregory Gym on February 25th, 2012. This is just one example of the good that can be done when people who sometimes virtually have nothing in common come together for a greater good. It felt damn great to be a Longhorn on Saturday night. I think it’s safe to say that myself along with millions of other people across the country cannot wait for the release of the first movie in The Hunger Games trilogy. I already have my midnight premiere movie ticket bought (hence the inspiration for this post), and I am probably going to have to reread the book again before the movie comes out. Over the past months, buzz has gradually been building about this movie online. Trailers have been released one by one which are slowly giving fans a sneak peak into the movie. We are all expecting an action packed movie that is as unique as the book. The way the movie is being marketed is quite interesting and unique as well. A new set of digital advertisements caught my eye today where characters from the book are featured in advertisements for fictional beauty products. Here is a screen shot of one, but click the link here to see the full fledged ads that have some very cool digital effects! They even automatically have options to share the ads to Facebook, Twitter, and Tumblr accounts. 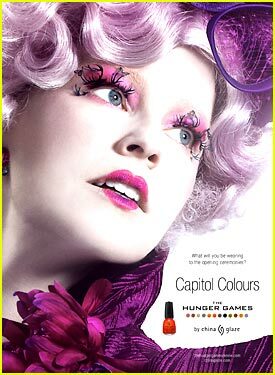 The ads all link back to the CapitolCouture.pn website, one of the many used to market the movie; this one in particular offers exclusive content to fans. The original microsite, thecapitol.pn, is more interactive and assigns users to one of the twelve districts and simulates an experience to keep them engaged and excited about the coming film. It then sends out blasts via twitter and using hashtags to spread the buzz even further. What other different tactics has Lionsgate Entertainment used to market this new film trilogy? Will you be there when the movie premieres? 95 days until the end of my four years of college. Is this real? I remember the last month of the summer after my senior year in high school. I had a countdown going then too — a countdown to the day I was going to move to Austin to start the next chapter of my life. It seems like yesterday! I remember when I was merely 15 years old and all I wanted to do was turn 16, get my license and drive myself around. I vocalized it to my parents quite frequently, and they always told me the same thing — that time proceeds to pass faster and faster with every year that goes by. At the time, I’d roll my eyes, because geez, 9th grade seemed like it was never going to end! Well, here I am! I have my first job interview next week (ahh!) with a Dallas agency, I’m heading to NYC again over spring break to (hopefully) do job interviews there, and I only have 3 more tests left… ever. Those are words I definitely thought I’d never say. I want to enjoy the time I have with my friends, experience things around Austin that I have yet to do over the past few years, and soak up as much knowledge as the University of Texas will allow me to in my remaining time. And a word to the younger ones out there (especially my sisters!) — don’t take a second of what’s given to you for granted… Experience everything you can and soak it up! And just because time flies doesn’t mean you don’t have the time to do every single thing that you want to! Like many other college-aged women, I cannot get enough of the Bachelor/-ette/Pad franchise. Between the attractive men, catty girl drama, and “true” love, once you start watching, you can’t take your eyes away from the screen. I am also an avid reader of the Reality Steve blog, where season after season, the show is recounted and spoiled in a very hilarious manner. It was last week, though, that a particular piece of information about product placement in a recent episode really caught my eye. In last week’s episode, Ben and his girls took a trip to San Francisco. A group date card arrived that read “Let’s check something off our leap list” or something to that degree, and then they all piled into very visible Honda CRVs and rode off to ski down the streets of San Fran. Now, if you’re like me, you are wondering what the heck a leap list is. Ben and a few of the girls are doing ITMs explaining it but acting like its a common term thrown around often in everyday conversation. Upon doing further research, I found a New York Times article describing this year’s Honda superbowl advertising strategy. 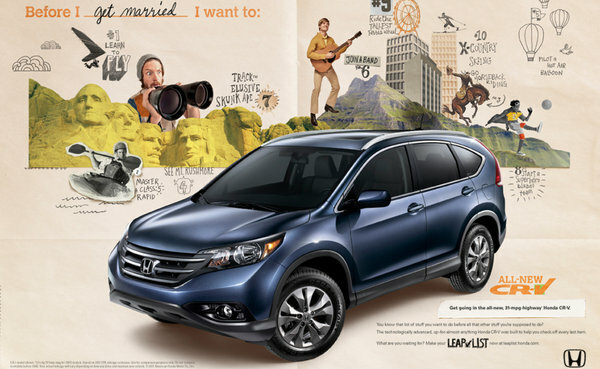 AMERICAN HONDA MOTOR is leaping back into the Super Bowlwith a commercial for its redesigned CR-V compact crossover, part of an extensive campaign that began this month and is centered on the “leap lists” of ambitious life goals compiled by twenty- and thirtysomethings. So if you’re one of those die-hard Bachelor fans who thinks that the show is 100% real… Note that if they can get girls to talk about these things called “Leap Lists” like they’ve been familiar with them their whole life, they can get these girls to do a lot more. Product placement, when done right in scripted TV, can be very effective, but this example was so obviously staged in something that is “supposed” to be 100% real, that both the brand and the show lost a little bit of credibility. Today I realized that I have been keeping up with this blog for a little bit over a year, so I took the time to look back at some of the first posts that I had written. I look at myself through this blog a year ago, and I remember how confused I was — about my futures, my goals… myself. Personally, I think I did damn good. A year ago, I had just gotten rejected from Texas Creative, the original reason I had become an advertising major, I was frantically searching for a last-minute internship, and considering switching my major to Public Relations. Hence the resolution. But this year I applied and was accepted into the TexasMedia program, travelled to London to work a summer internship, and took a trip to New York City, where I networked with 4 agencies in hopes of securing a full time job come post-grad. now I’m not really sure where the next year will take me. 2011 was definitely a year that has shaped my future. 2012 will be the year that begins it. On March 14, 2012 I will be turning 22, and for me that kind of signifies the real start to adulthood. 21 was a year to play and have fun, 22 means it’s time to get serious. On May 18, 2012 I will be graduating from the University of Texas. Shortly after that, if all goes as planned, I will be picking up and shipping out to New York City, fulfilling a dream I’ve had for years. That is what I call a plan. A year ago, I didn’t have one, and I told myself that soon I was going to have one. This might have been the first New Years resolution I actually made happen, ever. Well, cheers to 2011, and I cannot wait for 2012! 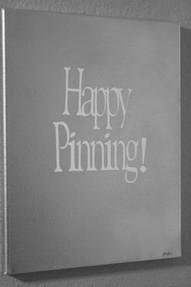 Let’s Get Pinning! Is a Pinterest Revenue Model in the Works? A few things inspired this post: an AdAge article that notes that Pinterest directs more traffic to the Real Simple website than Facebook, a conversation with my mom about how the creators of Pinterest are going to make money off of their service, and a blog by a friend looking at Pinterest from both a creative and digital aspect. I’ll admit it; I’m shamefully addicted to Pinterest. A friend of mine referred to it is “crack for women.” In a matter of months it has become THE new social sharing website. But here’s my question… as with every social site to date, there has to be some kind of revenue model. 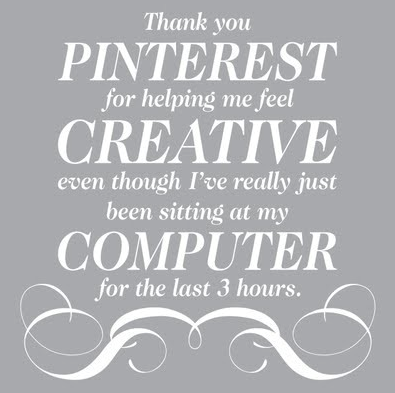 So how will Pinterest’s be designed and what does that mean for its ever loyal Pinners? Narrow targeting is possible; each account is linked to either the user’s Facebook or Twitter, and with the right tools, I feel that even things the user has already pinned could be analyzed to show the most relevant ads. So will we see banner and skyscraper ads? 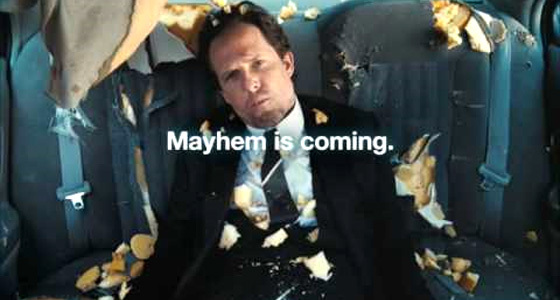 Maybe, but probably not. I could see something coming along in shape of a promoted pin, where brands pay for their pin to show up in certain users feeds, which not only would link back to the brand website, but the brand’s boards as well. The promoted pin could then also be repinned, which gives it more credibility to the next user that sees it because it will no longer be promoted by the brand, but by the friend. Right now, the possibilities may be endless. It will be interesting to see how the network continues to develop over the coming months, and if a revenue model is developed, how advertising will be worked into it.